Many children dream of being a star when they grow up. They imagine themselves as the lead singer of a rock band, starring in an action film or maybe even a prima ballerina in a world class ballet company. For many children, that dream is part of childhood fantasy and they grow up and find a more traditional career goal. But for some, that dream is their only vision and those with a true talent to back it up are quickly put on a path to develop that ability. Parents shuffle their kids around to piano lessons, ballet classes and children’s theater rehearsals. They sit through countless recitals, take hours of video footage and post photo after their photo of their little superstars doing what they love most – performing. Given the right training, support and positioning, these children have everything they need to take that dream all the way to the stage and screen. But what happens when you have a dream and talent but you are in foster care and you live in a shelter with 200 children? As you can imagine, not much. Those who were supposed to take care of you and see to it that you are on a good path in life are simply not there and the ones who are left to look after you can only see to your basic needs along with those of the other 199 children in their care. There is little time and fewer resources for music lessons and dance class and sadly, the dream never takes flight. But this past Sunday, May 21st, Voices For Children arranged for 50 foster children with dreams of performing to attend an unforgettable experience in which they were able to see firsthand what a path to stardom could look like given the right conditions. 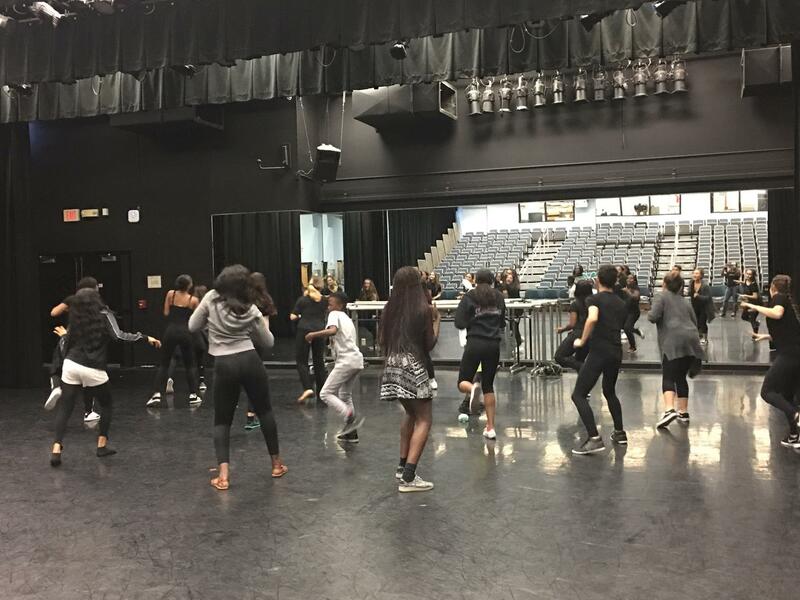 The children had the opportunity to spend the day participating in workshops with the students at New World School of the Arts, Miami-Dade County’s premier performing arts high school. Some of New World’s stellar alumni include Alex Lacamoire, the Tony Award winning composer of the hit Broadway musical “Hamilton” and Tarell Alvin McCraney, Academy Award winning screenwriter for the movie “Moonlight.” Last year’s graduating class of 106 students received over $24 million dollars in scholarships to arts programs all around the world and the opportunity to attend this school has the potential to cement the path of any child who sings, dances, acts or paints their way through their hallowed halls. While not all 50 of the children have what it takes to make it into this school, all of these foster children got to trade in their reality for a fun day of singing, dancing, and entertainment. But for those few who did have the talent and drive, a door of opportunity has been opened and they are now free for that dream of performance to take root. The school is eagerly awaiting “Kevin”, “David” and “Carl”, to reach the age when they can apply and audition for the program. These three young men have an amazing talent for dance and now people who have the power to grow and nurture that talent know it and will be looking out for them. The uncertainty of their future is over and the path to success is clear before them. There is a reason the school is called “New World” because for these three children, it now is. To help us provide more children an opportunity to achieve their dreams, please consider making a donation to Voices For Children.